Color:Dark Espresso finish Winsome Wood Set of 4 Contemporary style TV Table made of solid wood in Espresso finish The curved rectangular table top has a sleek appearance created during production by beveling the edge. Table size is 23-1/2-Inch L by 17-Inch D by 26-Inch H. They have multiple uses: for serving food- an extra place setting in a large group, laptop computer - or as an end table. they are a nice color, more cherry than espresso. I would think espresso would be a dark brown. they are sturdy, as I wanted real wood so it would last. they were wrapped in a thick plastic that was sealed tight so I had to use an X-Acto knife to tear if off if I wanted to make sure all of it came off but I appreciate the scratch free idea of the wrapping. I didn't realize it didn't come with a holder but they are so nice I'm keeping them open and placing them around my home as end tables. I feel like they're of multi use now. Home territory searches the web to find the best prices and availability on TV Tables and related products foir your home like Winsome Oversize Single TV Tables, Espresso, Set of 4. For this page, related items include products we find that match the following keywords: "TV Table" at our vendor partner Walmart - Click More Info / Buy Now to check for price rollbacks!. 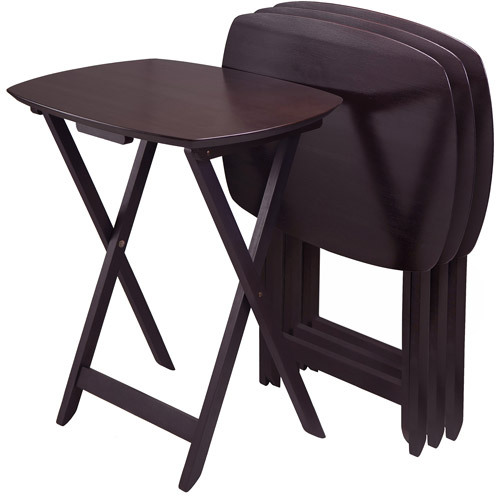 Winsome Oversize Single TV Tables, Espresso, Set of 4 is one of 9 TV Tables and related products available for sale through HomeTerritory.com, If you have any questions on this product, please give us a call at 734-971-1210 during the hours of 9am - 5pm EST for assistance. Thank you for shopping at Home Territory, the home furnishings superstore!